1960 saw a new body style for Ford Motor Company; the Starliner. This was a new roof treatment wherein the rear pillar wa made very thin and the roof curved from the top down to the rear deck. Befitting it's latest creation, the Starliner was also provided with upgraded interiors and a large engine. 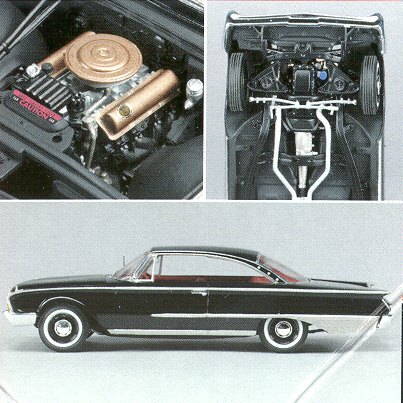 In this case, it was the 360 hp 352 cubic inch V-8. It was an extremely brave move on Ford's part and produced what was a superb looking car. Unfortunately, the market didn't see it that way and after a few years, the Starliner name and roof was gone. To my mind, as a person who normally does not build cars, AMT kits have improved a great deal over the last few years. Known to me only by their rather soft molding and poor assembly characteristics, there has become a real concern about quality control and it shows in this latest offering. To begin with, the body, clear, and chrome bits are packaged separately from the rest of the sprues. Those other sprues are not only bagged, but held by a rubber band to prevent them from sliding around in the box, a simple solution to scratched parts. Molded in the typical light grey, the over 100 parts are crisply molded and free from flash. There are also four tires that are well molded, but are blackwalls, so if you want whitewalls you will have to paint them on, not a pleasant thought. The chrome parts are very well done. Though you will have to break out the Bare Metal Foil to take care of the sprue attachment points, those are, for the most part, on the underside of the parts or in places where they will not be easily seen. Features that I have not seen recently on car kits are such things as separate exhaust system, a separate frame and suspension, separate interior panels, a detailed overhead inside the car body, separate gas tank (ok, so who makes a paint color of 'zinc'? ), separate hood hinges and heater hoses. Instructions are quite complete, being the typical drawings in 7 stages. All parts are named and any color is also annotated on all the parts. 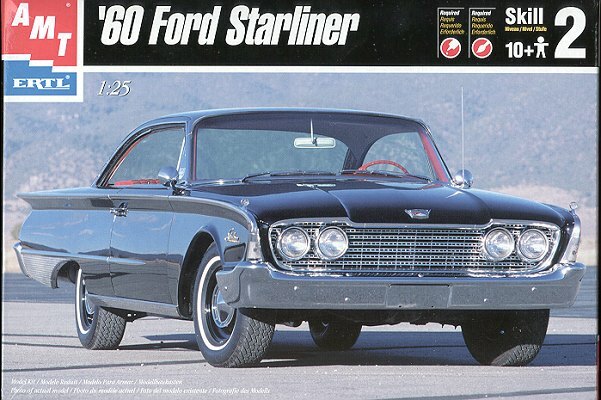 What I thought was a super addition is a complete chart showing 1960 Starliner interior and exterior colors. It even shows which interior colors go with which exterior colors. A very handy thing to have! The painting guide for the interior is also exemplary in noting what little bits are what color. Not being willing to leave this preview without noting something I'd like to see added, I would like to see at least a bit of history of the car. All that is given is a list of specifications, and that is for a 1958 Ford! I don't think that particular car has ever been kitted. If it was, I'd buy one in a heartbeat as it was my first car! What it all adds up to is one box jammed full of great looking car kit.